A shining gem of a Whisky from a hidden place. Suntory virtually defines the beverage business in Japan. Founded in 1899 to import and distribute wine, they quickly branched out into their own products. Then, in 1923, they stepped into the nearly sacrilegious effort of distilling a Single Malt Whisky in Japan. Since then, Suntory has expanded through home grown brands and the acquisition of established business around the world. They produce dozens of whiskeys, beers, liqueurs, and soft drinks that span the globe. Suntory owns and operates dozens of distilleries. But the Chita Distillery is perhaps their most secretive. We do know a few things though. It is their “grain” distillery — meaning that it is used for making whole grain (non-malted) spirits from wheat, rye, and some barley. We also know that nearly all of its production goes into Suntory blends — especially some of their higher-priced, premium offerings. 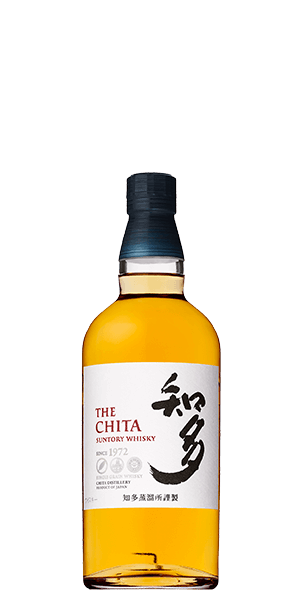 But Suntory The Chita Single Grain Whisky is the first stand-alone Whisky that reflects the true nature of this hidden, exotic place. And it is a savory, sweet, and lovely place indeed. Suntory really tries to keep this distillery away from public view. In fact, it was reported that when a local Whisky blogger in Japan was making a map of all the distilleries in Japan, an executive at Suntory called and asked him to keep Chita off the map. What does Suntory The Chita Whisky taste like? The Flavor Spiral™ shows the most common flavors that you'll taste in Suntory The Chita Whisky and gives you a chance to have a taste of it before actually tasting it. Mango, lemon meringue, and toffee pudding. Light with a chewy mouth-feel and notes of mango, grape must, orange-blossom honey, and roasted grain. Tender, sweet chocolate with orange zest. Fresh fruits on the nose, rich sweet cream and oak on the pallet. Aftertaste is long and fruity. Very special and enjoyable. Smooth whiskey with great flavor. Not the biggest fan... very “alcohol” rather than spirit taste ... rough and not very smooth .. Smooth, medium body, with just the right amount of smoke. Could use a little more complexity and mineraliness. Unique, but not memorable. Has a strong flavor of tropical fruits, a noticeable blend of apricot and mango. On the sweeter side, it is a pleasant drink to sip - but a bit underpowered. Wonderful light and sweet taste. Smooth and warming. I definitely need to get a bottle of this, the sample just isn't enough! Just a little better than Toki. Maybe I don't like Japanese Grain whisky? Enjoyed this light, sweet whiskey. Has a a pronounced citrus vibe, with obvious hints of sherry and honey. If you're already a whisky drinker, you need to throw what you know out of the window. This whisky will give you aromas and flavors you never expect. It has a sweetness reminiscent of a well made dessert--not at all cloying and seasoned just right. This whisky has a surprising amount of body and thickness to the mouthfeel. The finish leaves much to be desired as I expected more of an exclamation rather than a tapering off of already existing flavors. I'd liken it to the experience of seeing one great ball of fireworks with no follow up. If you like a super long, complex finish, this one definitely isn't for you. But if you like an incredibly smooth, elegant and easy to drink whisky, then this will be perfect for you. Definitely a crowd pleaser. Sweet, with a bit. Wanting more body. Interesting woodsy lemon aroma. Light flavor with a long citrus aftertaste. Great for sipping in the evening. Very little bite on the opening taste. A great sipping whisky. I certainly enjoyed it. Nose is very light with lemon zest and banana being most apparent. Flavors are bright and candy-sweet up front, before progressing into almost tropical fruit notes (I'm noticing fruitiness as a common theme in Japanese Whisky.) Prominent grain-y flavors come in before the finish, which is medium long, dry and just a touch tart. Mouth-feel is slightly oily. This one was a bit of a head-scratcher for me... It's very outside the profile I usually associate with 'whisky,' (or 'whiskey' for that matter). It's well made and quite unique, but probably not a go-to for me. I do think it could be very interesting as a mixer. Great start to your night. Light and refreshing. Normally I will take a couple of drinks to get the full flavor of a whisky, and then mix it. Before I knew it, this sample was gone. Looking forward to exploring more Japanese whiskies. Interesting. Could not place the mango flavor until viewing the spiral. I enjoyed the unique flavor of this one but not sure I could drink this regularly. Pretty good for pretty cheap. Lots of flavor best on ice or with soda water for the traditional style in Japan. Cinnamon, spices, vanilla. Surprising taste given subtle aroma and smell! A bit warm at the beginning, notes of tropical fruits, grain and wood, honey and merengue. When it touches the palate is warm and a sweet note invades all the mouth. Medium long finish. A nice baseline for Japanese whiskies. Very easy to drink more than you should.